Since this is the introductory stuff that I either A) already know or B) have a vague grasp on, I expect the first few days of this to cover more than 10 pages per day. Once I start getting into the book, I expect I’ll need to slow down to really experiment with the code. My learning style benefits from clear examples that I can try and riff off of and then describing what I’ve learned to make sure I really grasp the concepts. When I was on the tech support team for Headway I did a lot of CSS troubleshooting and working with other folks’ CSS. I had to understand what they were trying to do, figure out why their CSS wasn’t working, write code that worked and then explain to them how to fix their CSS. Doing this every day really sharpened my skills but left me with gaps in my knowledge. The book starts off with a brief history of CSS and explains why CSS has been so darn useful. I’ll admit that when I first encountered CSS in the mid 90’s I was a bit baffled about what it’s purpose was and how to use it. There weren’t a lot of blogs and tutorials out there at the time, so I kind of had to experiment on my own. Web design wasn’t my job, it was just a way of building an intranet site for my engineering team so we didn’t have to email out specs and design guides every day. I volunteered to do the intranet site because it looked like it might be something fun to work on while tests ran or I was stuck in long, boring conference calls. Once you understand why CSS exists, your web design life becomes much less tedious. After the history, we get a review of the terminology and how the language* is structured. There’s also information on external stylesheets, @import, comments, whitespace handling and media and feature queries. This is kind of cool and is supported by Firefox but not Chrome, at least not without an extension. I don’t know that it would be all that useful for me, but it’s interesting that it’s available. I also learned that the style sheets need to have a title to make this work. 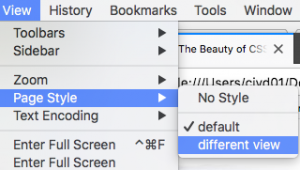 I’ve never seen it called out explicitly, and maybe it just seemed logical to me to do it this way, but @import directives have to be placed before other CSS rules or they get ignored. Through sheer luck I’ve been doing it right all these years. Now I know why I’ve gotten lucky. There’s a nice table of of all the possible feature descriptors you can use, many of which won’t be all that useful to me although I can see some of them being loads of fun when I get deeper into grid layouts. I’ve used screen width for responsive designs and I’m comfortable with that, but I’ve never used aspect-ratio before. * Don’t get pissy with me about CSS not being a ‘real’ language. I know that it’s a markup language but, seriously, anything that has a 1,000 page reference book written about it that can do what CSS can do should count as a language.